The signature heat of summertime is starting to rear its ugly head now but luckily, a week ago, it had been kept at bay. 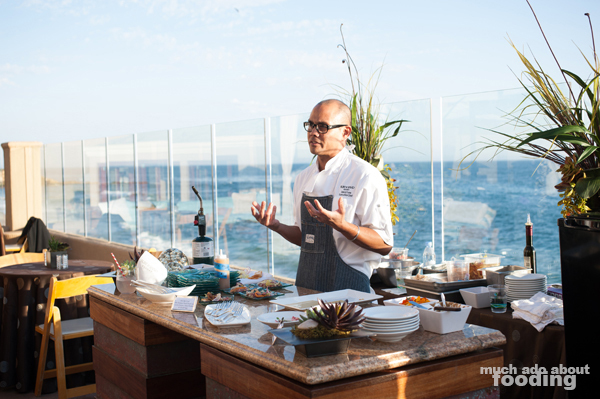 We were at Splashes Restaurant at the Surf and Sand Resort of Laguna Beach then, sampling some of the creative fare by their new Executive Chef, David Fuñe. What a gorgeous view that the resort has, especially from the Ocean Terrace area with wrapping windows and comfortable lounge furniture. 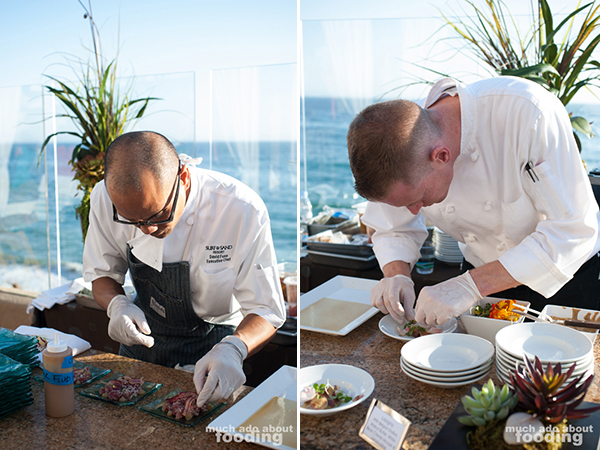 The reception was a sneak peek into the new fall menu launching in mid-September, and the weather was perfect. 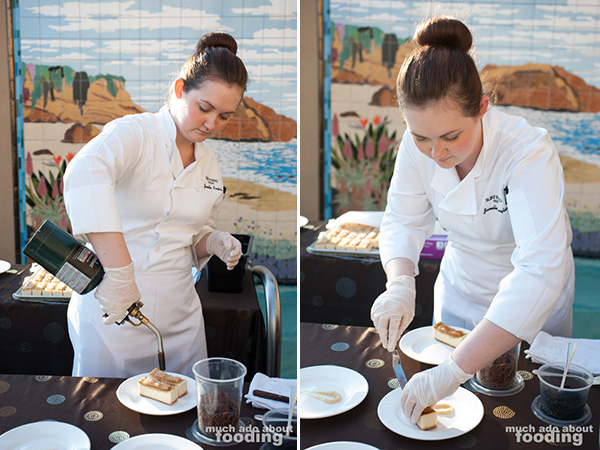 Chef David had treats for us that breezy evening and described his art with aplomb. 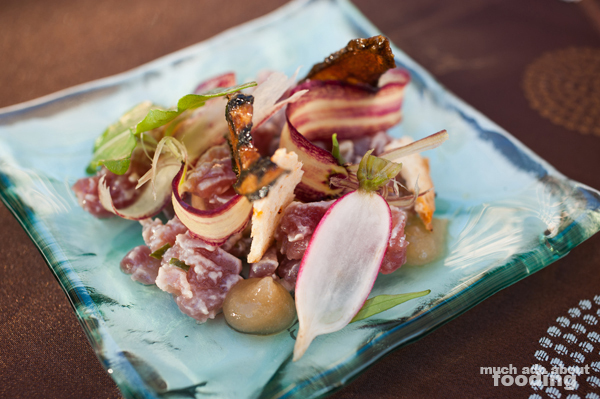 Having grown up in southern California in San Diego, he is no stranger to the cuisine of our region that loves to focus on fresh and light. Inspiration from his mother fueled his passion for the culinary arts but it did take a few career changes before he found himself at Portland's Western Culinary Institute. 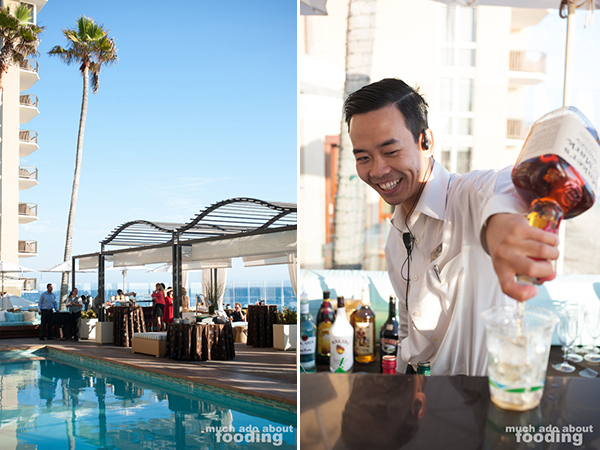 After an apprenticeship with Chef Tadashi and stints at various restaurants, Chef David finally found himself as the Executive Chef at Surf and Sand. I'm sure they are glad to have him contribute more to the already amazing restaurant reputation they have. 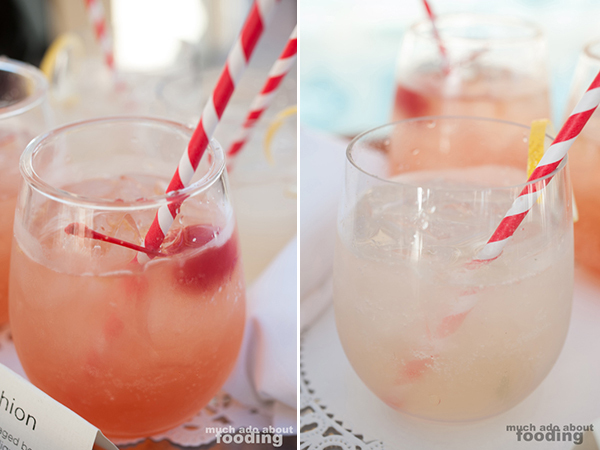 The drinks for the night were also a sneak peek of sorts as they were seasonal cocktails. We tried the New Old Fashion (Hudson un-aged bourbon, Koval honey chrysanthemum liqueur aged in oak barrel for two months, cherry, sugar cube, and bitters) which was more floral than a classic Old Fashion in a way befitting of the environment, and the Pamplemousse Fizz (Hendricks gin, Pamplemousse rose aged in oak barrel for two months, muddled mint, grapefruit, soda, and lemon twist) which is good for the person looking for something light and refreshing. In addition to drinks making their way around the tables, a bar with plenty of talent brewing behind it was open. We even caught up with our friend Ken there, Banquet Captain. With so many tasty options, it was difficult to pick some favorites but we've narrowed it down to write about them first. To be honest, these were definitely plates that are simple dishes in general but done well with careful skill. Sometimes the simplest are the best. We returned frequently for pieces of the Wild Mushroom Flatbread (with Tallaggio cheese, onion veloute, and mushroom duxelle), an elegant crisp with fresh ingredients and savory mushroom. The inset plates of Pork Osso Bucco (with Parmesan broth, pinenuts, spinach, and giant white beans) were swept off the serving trays usually as soon as they were brought out and for good reason. The tender pork fell off the bone nearly of its own accord, and the broth would be hard to beat. Some lucky plates even had a thick enough bone from which marrow could be sucked. I got one of those myself; hope everyone else followed suit! Eventually, we realized that the two favorites could also be combined - mushroom flatbread dipped in Parmesan broth, divine. There was certainly no lack of innovation there. 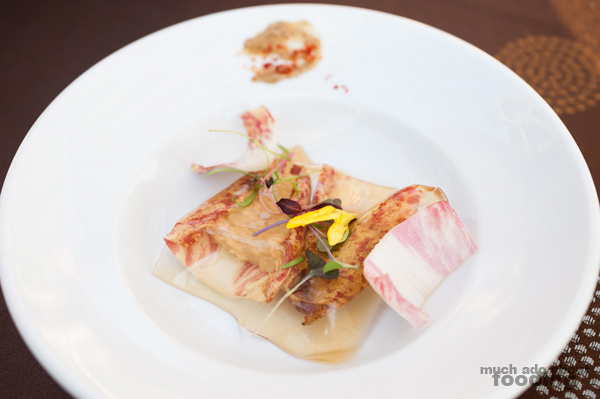 One look at Chef David's "Lasagna" (with Belgian endive, walnut butter, white bean chevre mousse, and langoustine) made us feel guilty for even touching it and ruining its art. The "pasta" was formed from a very thin gel that had the barest hint of color to set it apart from the rest of the plate. Each bite produced quite the layers of flavor. Then there was the Ahi Mi Cuit (with pickled pear fluid gel, local onions, fried pickles, and quail egg), a mash of tender ahi and crunchy vegetables. This was just about the other favorite of the crowd. 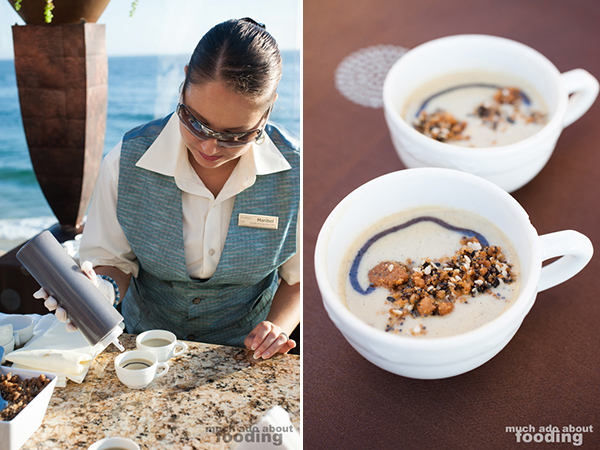 I even dared to sip at a miniature cup of his Charred Eggplant Bisque (with Everything bagel crumble) which did not hold back on its smoky flavor or thick creaminess. I said dared because I do believe I have a slight allergy to eggplants but alas, how does one turn away such a cup? I'll cover our desserts last in this post but must admit that we made our way over to the desserts first! It was just too tempting to see what was in store in the full-on station outside. When we saw that the chef was actively torching our cheesecake tops to brulee them per plate requested, we knew it'd be good. 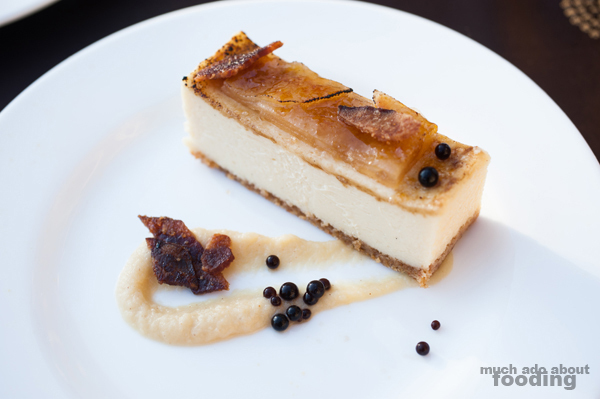 Maple Cheesecake (with apple bacon confit, bourbon apple puree, maple apple caviar, and graham cracker crust) was the masterpiece for the evening, a fantastic combination of sweet, salty, and savory. 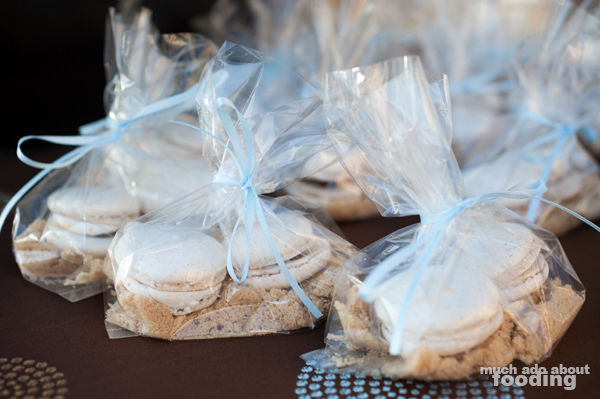 On the way out were bags of S'mores Macarons as gifts, looking like large shells on the "wet sand" of brown sugar. One bite into a macaron led to melty, oozing chocolate, quite the signature reaction from a S'mores. Lovely. It is clear that Chef David is making his mark on Splashes, and we are grateful to have gotten a sneak peek into his menu for the fall. 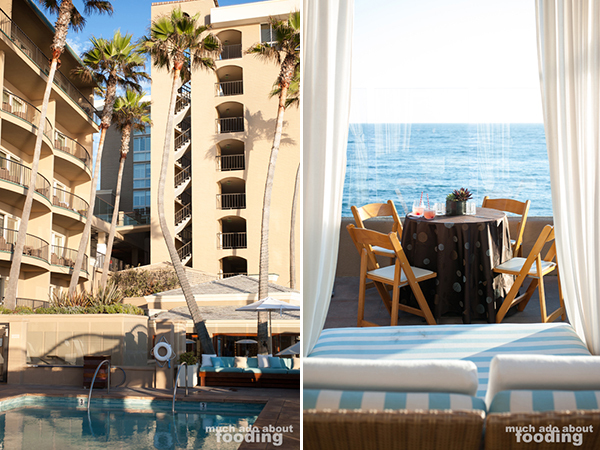 If you are interested in tasting his fare as well, Splashes Restaurant is at the Surf and Sand Resort at 1555 S. Coast Highway, Laguna Beach, CA 92651. 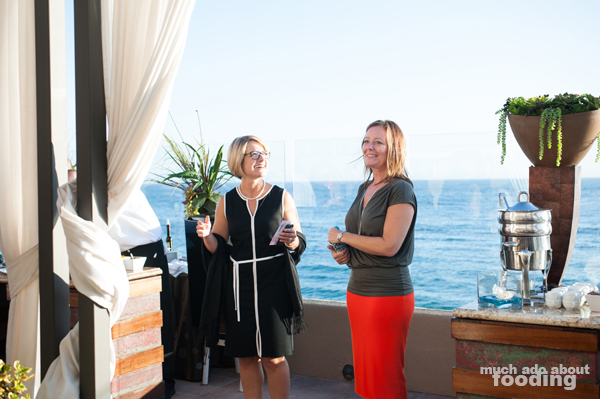 Our thanks go out to Chef and our hostesses that event. If you found those pictures and descriptions enticing, I do have a treat for you. 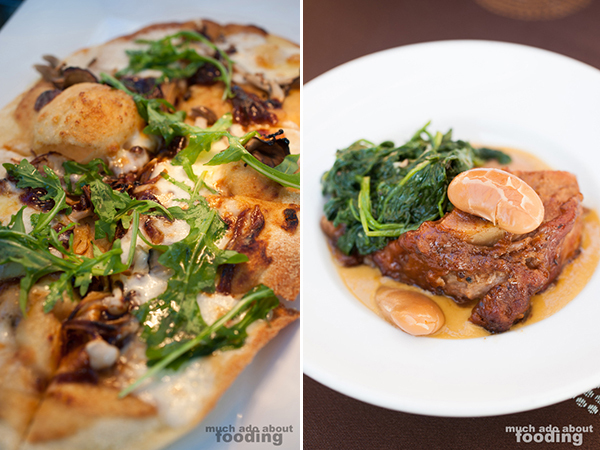 You can give the menu a try for yourself if you win the Dinner for Two in my giveaway! Check out the widget for details. The giveaway will run until 9/11/13 at 11:59pm PST. Winner will be contacted upon winning and has 48 hours to respond before another winner is drawn. Prize: (Retail value: approximately $200) A Complimentary Three Course Dinner for Two in Splashes Restaurant at Surf & Sand Resort. Excludes alcohol, tax and gratuity. Reservations suggested and accepted on a space-available basis. This certificate is not redeemable in cash. Expires 09-30-14. I would love to take my husband here for a relaxing and romantic date. Just sent 2 kids off to college! We deserve this for sure! I have been to Splashes at the Surf & Sand with my family a few times but for this event, I would love to take just my husband. We have a 10 year anniversary coming up and this is a short drive up the coast from Oceanside. Such awesome food and the view is breathtaking! Never been but love Laguna! 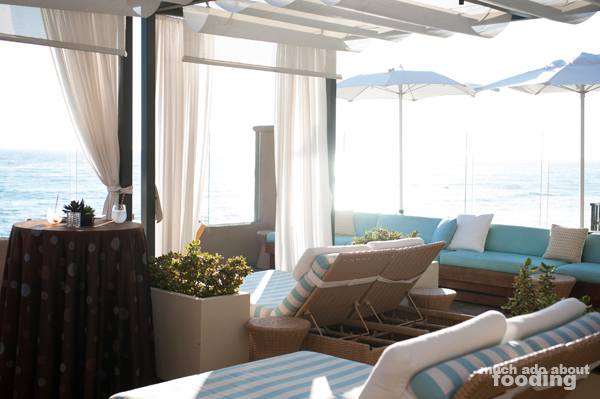 I love Splashes and have been there many times, usually for brunch. I would take my husband to celebrate our kids back at college. I would take my husband if I won. Thanks for the opportunity. I dunno, someone special fo sho! My husband and I both have September birthdays to celebrate. I would love to take my hubby here to celebrate a romantic night out since we've been too busy to spend any quality time together in such a long time. I was thinking of gifting this to my awesome husband & wife landlords. I would treat my hubby. We rarely go out. It would celebrate the start of a new school year. We are both teachers. The place and the food look amazing... So excited about enjoying the amazing view! We just had our 10 year anniversary. I would love to celebrate this milestone here with my husband! I would love to take my boyfriend there for his birthday, there would be no better way for him to turn the big 3-0!